E-discovery is constantly evolving, so if organizations stand still, they will lose ground. Many corporations and law firms are now re-examining their e-discovery processes and tools. 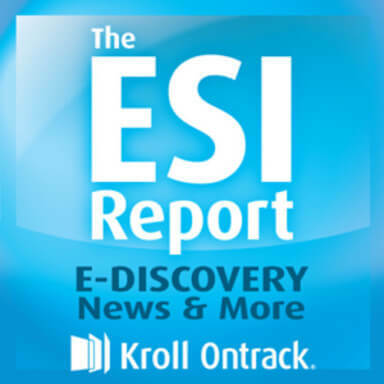 On The ESI Report, host Michele Lange, Attorney and Director of the Thought Leadership & Industry Relations division at Kroll Ontrack welcomes Ken Ewell, Vice President of SaaS solutions for Kroll Ontrack, to explore do-it-yourself e-discovery trends and how law firms and corporations are re-evaluating their role in the Electronic Data Reference Model. In the Bits & Bytes Legal Analysis, Kroll Ontrack Legal Correspondent, Elliot Westman, takes a look at the facts surrounding DCG Systems, Inc. v. Checkpoint Technologies and the recently issued Model Order on E-Discovery in Patent Cases coming out of the Federal Circuit.